Markey Home Remodeling has been offering low cost window installation for New Jersey (NJ) homeowners since 1981. Our prices are between $50 to $250 less per window than our competitors. Choosing the right product for your window installation project can be daunting. Working with a professional, insured window installation contractor saves time energy and money. 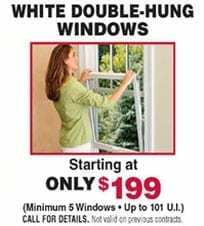 Volume: we purchase windows in large quantities, we get a volume discount. Low advertising costs, because the majority of our sales come through referrals from our thousands of satisfied customers. We don’t just show you our window replacement options; we show other windows available on the market. We actually demonstrate the features that make our windows superior in energy efficiency compared to other windows on the market. We are rated A+ by the Better Business Bureau and Angie’s List, and have been in business since 1981. We use our own certified employees to install your windows, no subcontractors. We have a showroom with all full size products on display.